York based rock band Mostly Autumn return to Leamington Spa for a special show at The Assembly on Sunday 13th December, they first played the town back in 2002 when they performed in the basement of Robins Well. Since then the band have performed locally at various venues including The Royal Spa Centre and several shows down the road at Stratford-Upon-Avon as well as in front of a sell out crowd at the Assembly in 2010 for the farewell gig of lead vocalist Heather Findlay. The show on Sunday is billed as “Return To Leamington” with doors opening at 3.30 and the band now with fabulous lead vocalist Olivia Sparnenn at the helm will play three sets including a performance of their latest critically acclaimed concept album ‘Dressed In Voices’ in its entirety. To mark the show I have decided with the bands approval to put together a selection of my favourite photos of the band I have taken at various performances, mount them ready to frame and have them available to purchase at the gig. 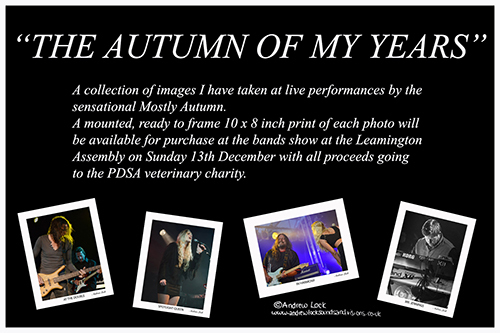 I have titled the collection “The Autumn of My Years’ and all proceeds will be donated to the PDSA veterinary charity. Tickets for the show are available from the Assembly box office.